A fantastic opportunity for young vocalists to develop new skills, exploring a wide range of jazz and soul inspired music alongside like minded young singers and under the leadership of professional vocalist and tutor, Debbie Jones. Lancashire Jazz Youth Vocal Ensemble (JYVE) is linked to our two successful County Jazz Orchestras. 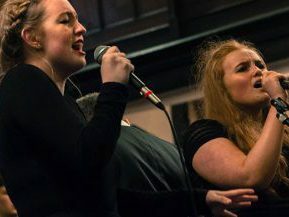 It’s a fantastic opportunity to develop new skills, exploring a wide range of jazz and soul inspired music alongside like minded young singers and under the leadership of professional vocalist and tutor, Debbie Jones. Members of JYVE will also have the chance to sing with the jazz orchestras. JYVE is for vocalists aged 11 -18 years. You will need to have some singing experience but you don’t need to have formal training or have sung jazz before – come along to a rehearsal and give it a go.